Ask any deer camp old-timer for a foolproof recipe, and you’re likely to encounter a lot of Campbell’s Cream of Mushroom Soup. 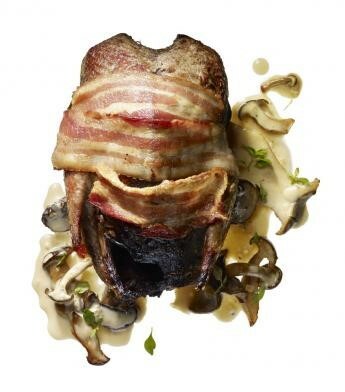 There is a reason for that: Mushrooms plus cream plus game meat adds up to a perfect trinity of flavors. This recipe chucks the can, and all its high-sodium gloppiness, while retaining the earthy comfort that made mushrooms and cream the go-to sauce for generations of hunters. 1. ROAST THE GROUSE: Preheat the oven to 425 degrees. Rinse the birds, pat dry, then smear each with a tablespoon of softened butter. Generously salt and pepper, inside and out. 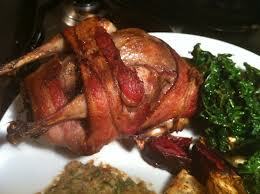 Wrap 2 bacon slices around each grouse, then set them in a roasting pan. Roast in the oven until the grouse is browned, about 25 minutes. Remove to a plate and let rest, covered loosely in tinfoil, while you make the sauce. 2. MAKE THE SAUCE: Melt 2 Tbsp. butter in a large sauté pan over medium-high heat. Add the mushrooms and about 1/2 tsp. salt and sauté, stirring frequently, until the mushrooms release a lot of moisture and begin to smell fragrant, about 5 minutes. Reduce the heat to medium and add the shallot. Sauté until soft, and until most of the moisture has gone out of the pan, about 4 minutes. Add the stock (or defatted drippings from the roasting pan) and thyme sprigs and simmer until the liquid is reduced by half. Pour in the cream and bourbon and simmer until the sauce thickens, about 3–5 minutes.